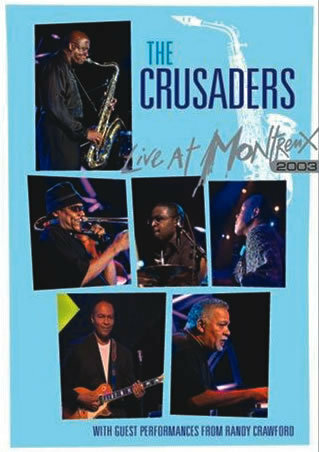 The Crusaders haven’t been a commercial (or, arguably, artistic) force in a quarter-century, and only two original members, keyboardist Joe Sample and saxophonist Wilton Felder, were still onboard at the time of this 2003 gig. But little about the group had changed since its ’70s heyday, and that seemed just fine with the Montreux audience. Touring behind their then-recent album Rural Renewal, the Crusaders still walked a fine and satisfying line between the smooth-jazz and light funk that catapulted them into the mainstream once they abbreviated their name from Jazz Crusaders. Sample and Felder are fine musicians, no denying that. Although there is a decided lack of edge to their playing, it’s robust and they run a tight ship: the lineup for this show, which included Ray Parker Jr. (of “Ghostbusters” fame) on guitar, Stephan Baxter on trombone, Kendrick Scott on drums and Freddie Washington on bass, finds a non-challenging groove early and stays with it. On “Creepin’,” a ballad from Rural Renewal, Sample’s Fender Rhodes work is gutsy and bluesy and both Felder and Baxter turn in strong, meaty solos. “Put It Where You Want It,” a mid-tempo Stax-like R&B jam, is the first of the night that kicks up any dust: Felder is wailing, but Parker, on his first real showcase solo, only demonstrates that he’s no innovator. The program doesn’t truly pick up steam until midway through, when vocalist Randy Crawford joins in. Crawford sang on the band’s biggest hit, 1979’s “Street Life,” and she handles it masterfully here, bringing a true soul to the proceedings that was only hinted at before. Easily scaling from low to high notes without strain or bombast, she’s a class act. Her first song with the group, B.B. King’s “The Thrill Is Gone,” is a highlight of the set, and she sings “Soul Shadows” in a subdued, sensual voice. Only her take on John Lennon’s “Imagine” fails to gain any traction. And why the cameras, otherwise utilized to great effect to spotlight the individual musicians’ abilities, repeatedly return to a pair of robotic toy dogs traversing the stage is anyone’s guess. The set ends with Parker delivering “Ghostbusters,” which comes off as the gratuitous pander that it is-the audience responds to “Who you gonna call?” with “Crusaders!”-but by then the Crusaders have already proven to Montreux that they’ve still got what it takes.